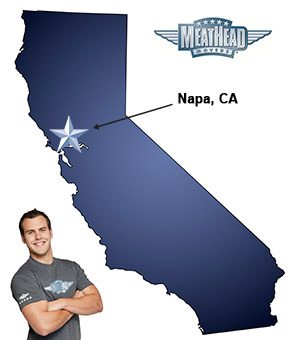 For a trouble-free move to Napa, Meathead Movers is the company for you! Our professionally trained student-athlete movers are ready to get you into your new Napa home. Welcome to Meathead Movers of Napa! The name Napa is commonly associated with delectable wines. This is because the Napa Valley in California is flush with wineries, making it one of the premier locations for wines in North America. If you are considering a move to Napa for a new job or to enjoy the wine culture of the area, you’ll want to check out what Meathead Movers has to offer. The city of Napa lies along the Napa River and is home to over 75,000 residents. Napa was one of the first regions to be settled in California, and grew in popularity because of the 1850’s Gold Rush. With its mining and fertile lands, Napa was quickly established as a hub of economic activity throughout the region. In recent years, Napa has gained momentum due to the redevelopment of its riverfront. The city has several historical attractions including the Napa Valley Opera House which was erected in the 1800s. Napa is also a convenient starting point for a tour of the wine country throughout the valley. When relocating to Napa, it is important to find the best Napa movers to facilitate the process. For the highest quality service, Meathead Movers is the best choice. Meathead Movers has over fifteen years of experience moving in California, working for all types of clients. Meathead Movers has adeptly handled numerous moves including in local, long-distance, and commercial moves. We also provide reliable packing, storage, on-site relocations, and our distinctive moving concierge service. At Meathead Movers we pride ourselves on having the best most reliable movers in the industry. We ensure this by thouroughly screening and training our respectable clean-cut student-athlete movers. As an added bonus, Meathead Movers is known for its HUSTLE, wherein all employees jog while not carrying anything during a move. Clearly, Meathead Movers is the best of all Napa movers, but to find out for yourself contact us for a free moving quote. With our 100% satisfaction guarantee, the only thing you have to lose is the stress that comes from moving! Moving to Napa? Here are some helpful resources. Very professional, friendly, and well trained. All of my stuff was wrapped and protected and I didn’t worry about a thing. The college students did their job very well. Better than expected. Your team is AMAZING. Very hard working and the customer service was spot on. Thank you for making a stressful time much less stressful. Every interaction with your company was excellent. Meathead had been great about contacting us every step of the way. I get updates from professional staff, and replies to my emails within moments. As we relocate for work Ina very short timeline, they have made this as stress less as possible! Employees were very professional and hard working. Please see my comments on the hard copy document I gave back to Nick.